After several days of packing, securing and brainstorming, the bus was ready for it's journey to the North country. 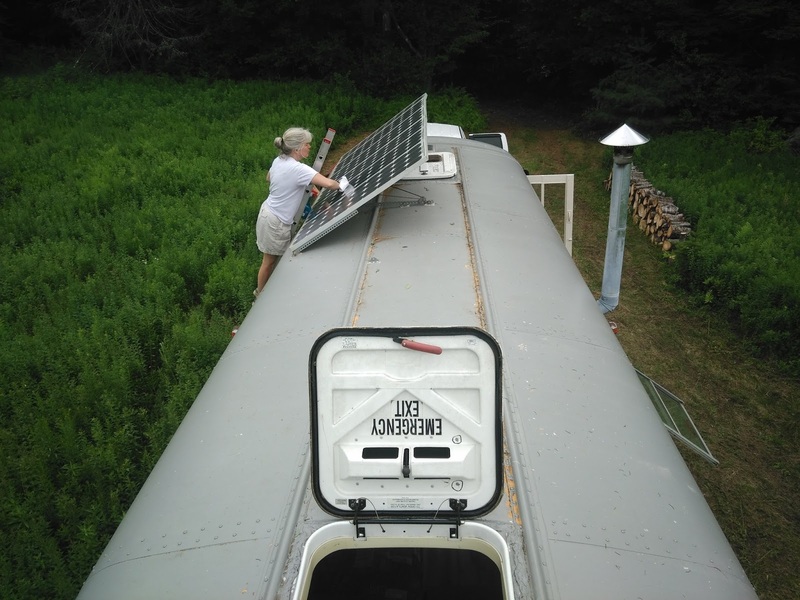 The solar panels were strapped down to the roof, the chimney pulled off the elbow, and all loose items were stowed. The fuel gauge was at about a quarter of a tank. It's a big tank, but I don't know how big, and I didn't want to run out on the trip. To err on the side of caution, I dumped 20 gallons of fresh diesel in. At ~6 mpg, from what I found online, this would give me enough fuel to get there, and then have a good reserve. I registered the bus for the trip, which gave me ten days to drive it to get it inspected, so I was "legal." The registration cost a bit more than I remembered, but I felt better knowing I did the right thing and could avoid any Police trouble along the way. Still... 2018 stickers on Veteran plates, and OIF & OEF campaign ribbon bumper stickers can only do so much to hide a guy driving a home-made camper up I93 from State Police. My Mum volunteered to chase me up there in my truck. Between the bus and the truck, I hoped I would have enough tools and "stuff" to repair anything that stopped working en route, but it was still a little nerve-racking. This is only the fourth time I have driven it on the road, and it would be the longest trip. It runs smooth in the yard... but that's not chugging up the Notch. I left work early on Day 10406, and around 1:00pm we set out for the highway. It was hot. I had the roof hatches open, and most of the windows down for some ventilation. With all the airflow, I couldn't hear the radio at all! I started off slow, and picked speed up to about 55mph on 93. Everything was looking good. I picked up to 65mph. Going up the big hills, I had the gas pedal on the floor, and the speed would steadily drop. The motor was working hard. Coming up over a hill into Ashland, I got an illuminated master caution with beeping tone. Low rotor? Stabilator out of Auto mode? Worse. "LOW OIL PRES / HIGH WATER TEMP." Two separate issues that share the same caution light on this bus. I brought the speed back, and the tone went away. The light went out. Well, which one was it? Oil pressure was a bit better than 30 PSI on the gauge. Water temperature was in the middle of the gauge, around the 210' mark. Is that high? It occurred to me that I didn't know what normal ranges were for these things; nothing else I drive has values on the gauge! My first thought was that oil pressure was low... but I knew the oil was clean and full. Could I push a motor with low oil pressure another hour, through the Notch, just to get it there? I could feel the hot air coming from the vents... and the bus was losing speed on hills... maybe it's overheating? I nursed it to Lincoln, slowing down to 55mph or so. Climbing hills set the alarm off again several times. If I was low on coolant, I could add some water, there. 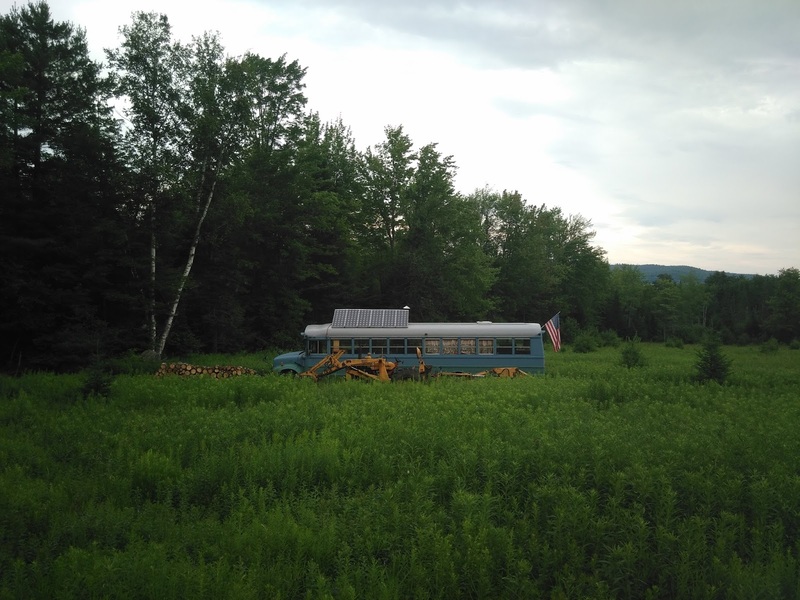 I pulled into a gas station, where no one paid any mind to a big blue and green bus. My camouflage pattern works. Mum went in to get the Caledonian Record, and I fired up the laptop, scouring the internet for a cause for the indications I was seeing. Data for the International 3800 online is as varied as the jobs that this engine and chassis perform. We sat in the cabin with the hood open. My Grandmother called to check in, and I asked for my Grandfather. 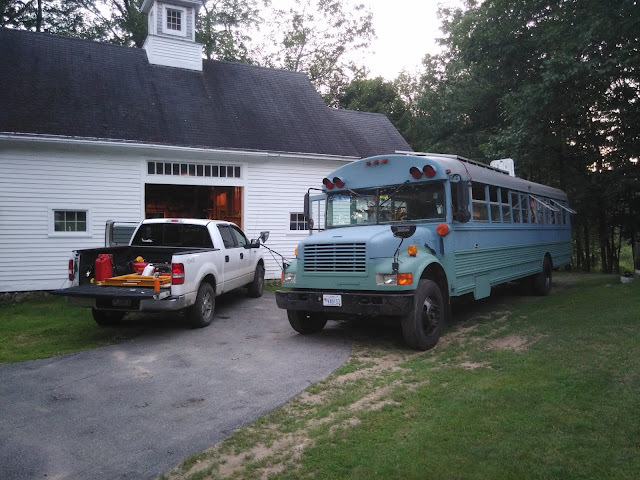 After telling him what I was seeing and what conditions the bus was driving in, he admonished me for working the engine too hard on a hot day, and to slow down; always a humbling experience! It made sense. This isn't a highway bus, this is built and geared for picking kids up in the suburbs, not for bombing up mountain passes at highway speeds. The coolant and oil were both fine; I was working it too hard. We let it cool for half an hour, then continued North on 3, through the Parkway, and down from the Mountains, all at about 45mph. No issues. We had passed five Staties without getting pulled over (I had forgotten a bag of coffee, so I couldn't even offer the Trooper a cup if I got stopped.) Despite overheating my motor, treating the bus like my truck, it had made the climb into and out of the mountains. Now we came to the final challenge; 150' of muddy driveway. My Grandfather showed up to help, bringing extra logging chains. I fired up the backhoe, and left it idling out of the bus's path. We were planning on it getting stuck. Pa and I surveyed the wet driveway. He seemed reasonably sure that it would make it through, but I was skeptical. 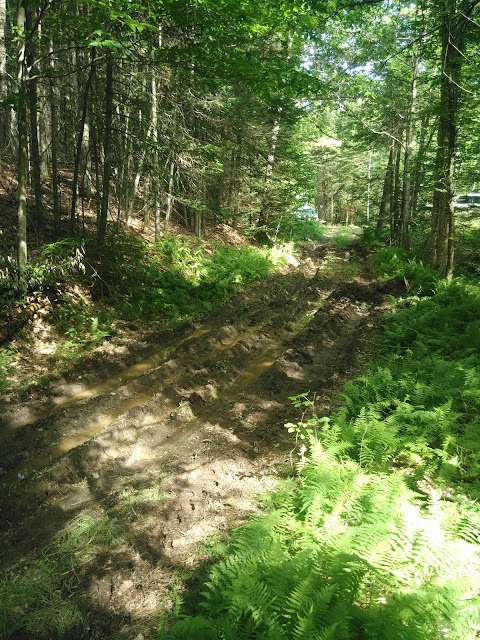 He also had plenty of experience driving 2 wheel drive dump trucks into roads like these. I backed the bus up, so I could turn wide at a constant speed into the skinny driveway. I had the transmission in first gear. I pressed the gas pedal and descended into the muck. The key, when you're in soft stuff, is to maintain traction. If you can't do that, maintain forward motion. If you stop, don't jam on the gas and spin the tires; you'll just dig yourself deeper. I maintained pressure on the gas pedal by ear, and rolled through the first wet spot... the tires were spinning... then the second wet spot... the third spot at the turn up... and I was through! I was amazed. I thought for sure the next few hours would be spent hauling the bus forward a few feet at a time with the backhoe, but it made it. 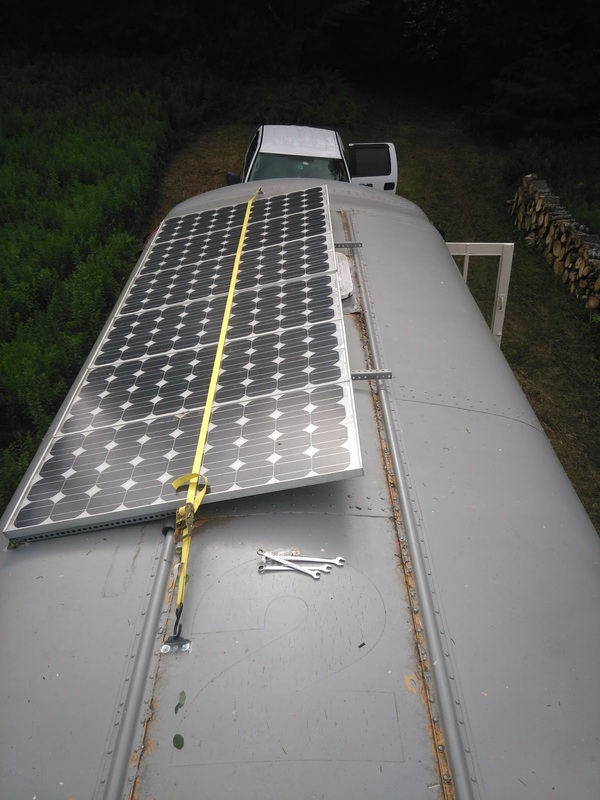 We spent the next few hours leveling the bus, unstrapping the furniture, deploying the solar panels, and installing the chimney. The bus is now in the field, doing the job it was built for. 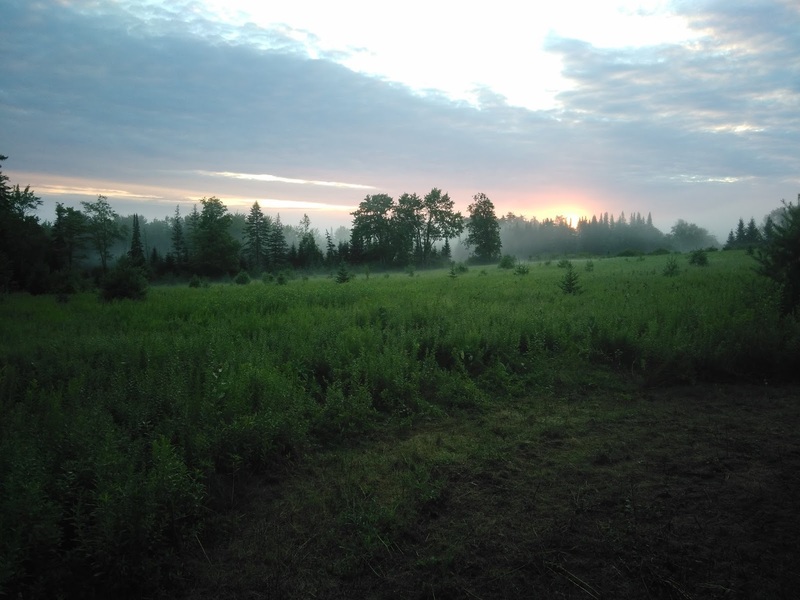 Zeke and I spent the night, to be greeted by a pink sky around 4:30am, then a misty sunrise around 5:30am. We had coffee and oatmeal together, and spent the day catching up on these blog posts. An Outhouse would be handy. And water.